What do Council Nodes do? 2. Select the amount of CRO to stake (minimum 10,000 CRO). Sign up for an account at AllNodes. Click on ‘+’ and choose cryptocurrency - Crypto.com Chain. Create an Ethereum wallet or buy a Hardware wallet. For more AllNodes details, please refer to this FAQ. Staked CRO accrues interest at a very attractive 12% APR, this beats any traditional savings product out on the market. All Crypto.com Wallet & Card App approved Users except citizens and residents of Hong Kong SAR, Singapore, Switzerland, or the United States of America. Can I stake the locked CRO from the airdrop for the Council Node Seats? No, only unlocked CRO from the airdrop will be eligible for staking. How do I calculate how much daily interest I will receive in CRO? When will I start earning Council Node Rewards? On the Crypto.com Wallet & Card App - With CRO staked, you will start earning from Day 1 after the Council Node Seat reaches the 500,000 CRO staking goal. On AllNodes - Users will receive the first reward distribution in a month after depositing 500,000 CRO, after which it will be credited on a biweekly basis. How often are the Council Node Rewards credited? On the Crypto.com Wallet & Card App - The Council Node Reward is credited every 24 hours, at 12:00am UTC, into the CRO wallet for immediate spending or trading. On AllNodes - Please refer above. Is there a time limitation as to how long I can stake a Council Node Seat for? There is no time limitation. Is there a limited number of Council Node Seats available? The number of Council Node Seats are unlimited. 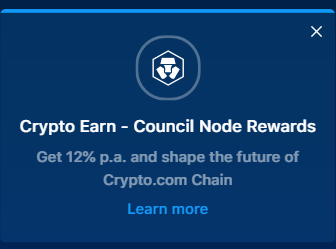 Can I stake CRO on both the Crypto.com App and AllNodes to earn the Council Node Rewards? Yes, you can stake CRO on the App, as well as on AllNodes (*Note - Users may not input their App wallet address on AllNodes). Is there a maximum limit as to how much CRO I can stake on the App and on AllNodes? There is no maximum limit, both on the App and on AllNodes. However, if you wish to stake more CRO via AllNodes, you will need to carry out multiple deposits as AllNodes only accepts a single collateral deposit of exactly 500,000 CRO. Can we pool our own MasterNode on allnodes.com? AllNodes require a single collateral deposit of exactly 500,000 CRO. Are citizens and residents of Hong Kong SAR, Singapore, Switzerland, and the United States of America also restricted from CRO staking on AllNodes? If I choose to withdraw my CRO stake, how long will the withdrawal process be? The withdrawal process will be instant. What happens when I withdraw my staked CRO after the Council Node Seat has been fulfilled? Daily CRO earnings will stop appearing in your CRO wallet. You will not be able to stake CRO again within 24 hours of withdrawing. Can I stake CRO again after I’ve withdrawn? Yes, you may stake CRO again 24 hours after your last withdrawal. Can I stake more CRO when I choose to stake again after I’ve withdrawn? Yes, there is no maximum limit to how much CRO you can stake, but you cannot stake again within 24 hours of withdrawing. When someone makes a withdrawal on a fulfilled Council Node Seat that I’ve staked, will that affect me in any way? No, the Council Node Seat will stay fulfilled, and you will continue to earn your share of daily interest. Note: After Crypto.com Chain Mainnet is live, deposit and reward rules may be adjusted to incentivize participants to contribute to the network and adhere to performance standards.